Finally, An All-In-One MFI Solution For The True Enthusiast. An all-inclusive kit that will allow for an easy installation. 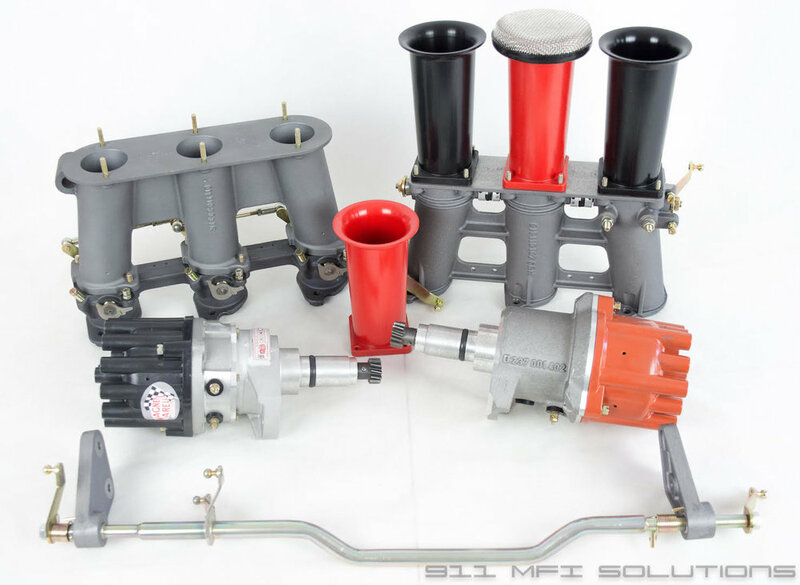 Our MFI kits come complete with the essentials required to install the components on your 911. In addition, we offer a choice of two colors for the plastic stacks, and an optional fuel line bracket kit. The kit comes with the square gaskets for the stacks, as well as six runner gaskets for your selected engine. In addition to the included six gaskets, we offer an option for a complete leak-preventative installation which will include 6 additional gaskets, as well as new blocks for the flanges. In addition, the kit includes all throttle links, hardware, and the cross link required to finish the installation. Intricately machined aluminum using only the finest 5-axis CNC machines. The 5-axis machining process allows for the most precise manufacturing of these manifolds. Not only are the parts machined on the X-Y-Z plane, but also on a rotational plane. This translates into much more consistent milling as a result of the tool not having to move around the actual component it is machining. This allows for highest possible finish quality and overall improved structural integrity of the component. Offered in All Conventional MFI Sizes. Whether you have a 1969 2.0 E/S, or an RS 41-43mm Port Diameter/46mm Butterfly, will find the size you need in our options drop-down. Our kit is offered in 2.2 E/S (70-71), (72-73) 2.4 T/E/S Spec, RS-Spec, and the afore-mentioned 1969 2.0 E/S Spec. In addition to the butterfly stacks, 911 MFI Solutions offers programmable distributors to allow for fine tuning of the timing using either a USB connection with your computer, or connecting using Bluetooth to your Android smartphone. make it difficult to generate a steady price for these kits. Between the newly imposed tariffs and the continuously varying conversion rate between Euro and the U.S. Dollar, producing a set price for these kits is currently impossible. We ask our potential customers to please understand that an intricate situation like this one leaves us in a consistent guessing game of what the items may cost the next day. Pricing posted on the 911 MFI Solutions products are subject to terms below. Check with us to get updated cost when you're ready to order. IMPORTANT! Dear valued clients, please take a few minutes to read our policy regarding these special products from 911MFI Solutions. Firstly, we value your business greatly and view each one of you as a future "Team Member" relative to purchases both large and small- both shop and end user. TRE/ 911 MFI Solutions and our team in Germany have all special products manufactured there. So we are subject to a number of unpredictable conditions. This is where the issue of "floating/unstable costs" on our end relative to importation to the USA comes up. TRE MOTORSPORTS and 911MFI Solutions are asking our clients to please work with us in understanding that we are doing our best to keep pricing stable with our "baseline pricing" to be as competitively LOW as possible- however if for some reason the USD vs Euro exchange increases, we must pass this on to our clients. Additionally, should the tariffs be imposed, we must pass this on as well. This is a reality in our ever changing Political and Financial climate. The good news: We are a professional operation, and our sense of equity and fairness is priority number one in our Business Stratagem. Here's the deal: The issue of unstable pricing goes both ways- and we are making a PROMISE to our clients that if the Euro falls (at time of order) against a "stronger dollar", we will pass these savings on to you -at time of purchase. If and when tariffs are imposed, then we add the corresponding amount to your cost. Of course if they are modified, or rescinded, then we adjust accordingly. Note: TRE Motorsports and 911 MFI Solutions maintains a decent inventory of product at our California facility. Pricing for these products is set at time of our importation to the USA. For the above reasons, we cannot process the purchase of the 911 MFI Solutions products through our shopping cart system. Each sale is unique and requires our personal attention. Please contact us for the latest quotation and availability.